The 2018 Honda Civic Hatchback is just one of the many Civic designs shoppers near Mount Laurel can opt for, but it is one of the most versatile. With a standard 1.5L turbocharged engine under the hood, drivers can feel the 174-horsepower kicking in at the tap of the pedal. Want to experience the road like never before? Well now drivers can take each turn with confidence thanks to the fully independent multi-link suspension. It’s clear to see the main difference in this design compared to other Civic models, as this model is a hatchback. There are many benefits to having a Civic Hatchback, one being the ample cargo space. While passengers will never want to leave, onlookers will want to take it for a drive. From the standard 16-inch alloy wheels to the available power moonroof, motorists will be cruising around town with all eyes on them. Driving a vehicle with intelligence is such a great feeling, and saving money on it is an even greater feeling. With help from our Honda specials, shoppers near Mount Laurel can get a great deal on a quality car. While taking advantage of such specials is a no-brainer, the technology inside the Civic Hatchback will blow the minds of shoppers. Thanks to the available Bluetooth® Streaming Audio, SiriusXM® Radio, Pandora® compatibility and HD Radio™, drivers and passengers will never be out-of-touch on the road. 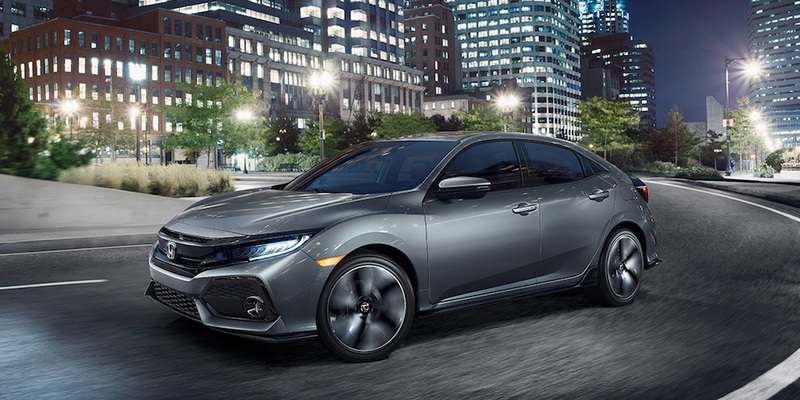 Burns Honda cares about each customer and their safety, which is why the 2018 Honda Civic Hatchback is full of standard and available safety features. The Honda Sensing® is a suite of safety features that keeps drivers alert and aware of their surroundings. With technologies like Collision Mitigation Braking System™ (CMBS™) and Road Departure Mitigation System (RDM), motorists finally have an extra pair of eyes. Whether drivers are traveling solo or with a group, they can feel confident that they are in good hands in all situations. For more information about the 2018 Honda Civic Hatchback, contact Burns Honda at (855) 571-4863 to schedule a test drive.